Wheat grows thick in southeastern Washington State. 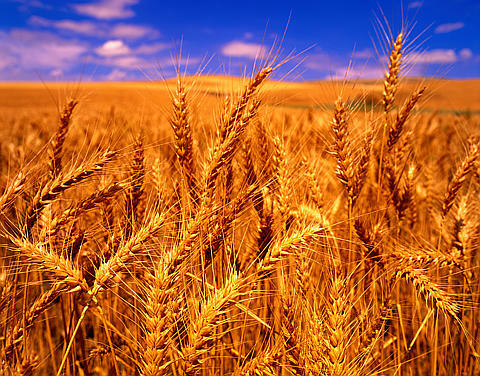 But even amidst American food bounty, food security concerns are mounting. The intersection of food, agriculture, and science is increasingly important. How do we protect and preserve vital sources of human nutrition? Two PNNL soil ecologists joined an October jamboree of ideas in Irvine, California sponsored by the National Academies of Sciences, Engineering, and Medicine (the National Academies). It's part of a longer-term attempt to influence U.S. farm policy. The idea: Find and recommend the most promising scientific breakthroughs in food and agricultural research. PNNL's Janet Jansson, a leading microbiome researcher, is one of 13 scientists on a National Academies executive committee that since February has been planning and assembling "Breakthroughs 2030: A Strategy for Food and Agricultural Research." The report, slated for publication in the spring of 2018, is intended to set an ambitious 10-year U.S. research strategy for food and agricultural research. The goal, said Jansson, is a "moonshot" for the benefit of vital food systems. Designing the rocket for that effort and packing its cargo bay with facts requires identifying the issue's biggest challenges, opportunities, research needs, and knowledge gaps. The October 2-4 event, at the Beckman Center of the National Academies in Irvine, gathered together both the executive committee and 40-plus interdisciplinary experts interested in contributing to the report's substance and direction. Such science "jamborees," open and energetic forums for sharing ideas, are a National Academies staple. Among the experts in agriculture, farm economics, nutrition, plant biology, sustainability, health economics, and plant genetics was PNNL soil biochemist Vanessa Bailey. She investigates the role of microorganisms in the soil carbon cycle; how stores of carbon are protected (or made vulnerable) in soils; and the effect of drying and rewetting cycles on terrestrial fluxes of carbon. "The jamboree was phenomenal," said Bailey. "Very high energy, with diverse experts from all domains," including from the food, water, soil, and animal research realms. Central to it all, she added, are "the most audacious challenges beyond the next decade" in land sustainability, and in the production of food, fiber, and fuel. "I was very energized after the jamboree," said Jansson, who described a rich intermixture of eclectic disciplines, intense breakout sessions, and freewheeling "flash presentations" of fresh ideas. "There was a lot of passion, and a lot of interest in these critical needs of science." Organizers established five focal points for the experts invited to Irvine: "greener" plants, better animals, reduced food waste, improved food safety, and pathways to resilience and sustainability in food systems. For each one, the executive committee had sent around, in advance, a sharp set of a dozen or more questions. Under "greener" plants, for instance, the questions included: How can we reduce the agricultural water footprint by 50 percent? How can we manage carbon loss and agricultural greenhouse gases? How can we harness the microbiome to make agriculture more efficient? Among members of the executive committee "I am the microbiome expert," said Jansson. It was a word not everyone knew at first. "But by the end of the jamboree," she added, "everyone was using it." During the event, the invited experts submitted 40 or more "IdeaBuzz" suggestions-the science equivalent of blue-sky, big-idea speculative thinking. There were science pitches on reinventing the potato, better hybrid wheat, boosting biodiversity, vertical farming, hydroponics, biofilm control, deep tillage, Hopi dry-farming cropping systems, a world soil-information platform, turning retail food waste into animal feed, agroecology, cultured meat, and urban agriculture. The aim of the final report is "a sea change built on previous studies," said Jansson. "Everybody realizes this is a new research future, one in which we use all this specific information for specific targets." Agriculture lives in a world of environmental and social "tipping points," she added. For instance, more than 50 percent of the world's farm land is "moderately or severely degraded," according to one United Nations report cited during the Irvine event, and by 2030 the global population will reach 8.5 billion. All this and more, said Jansson, creates "a sense of urgency" among scientists. The October 2-4 Irvine jamboree was followed by a two-day meeting of the coming report's executive committee. In the next few months the emerging document will go through a peer-review process. By next spring, the final report may become a template for international action. But for now the focus is on U.S. needs in food and agricultural research. "The target is Congress," said Jansson, who posed the operative question: "What can America do?"